We have been Bostik craft bloggers for six months now, and have had tremendous fun crafting lots of fun things for the challenges. We were challenged to do a jungle themed craft for this month. Now J has been on safari and seen lots of wild animals there. So he was brimming full of ideas when I told him we had to craft wild animals. We settled on creating some cute and easy animals using paper plates. We have crafted a panda, a lion and an elephant using some of the materials that came in this month's Bostik craft box. You can have a go recreating these animals. Or you can craft some others using paper plates. J has sketched a few ideas to create a monkey, a giraffe, a cow and a dinosaur. I will put those on the blog once we have made them. In the meantime, here is how we made our trio of wild animals. Sketch the outline of panda ears and a face on the paper plate and cut it out. Stick a pair of googly eyes on the face. Draw oval shapes around the googly eyes and colour them in with a black crayon. Colour in the ears as well. Stick a black pompom for the panda's nose. Use a red crayon to draw the mouth. Your Paper Plate Panda is now ready for playtime. Draw a pair of ears on the paper plate and colour them in yellow. Stick a pair of googly eyes on the round face. Cut lots of strips of orange tissue paper and stick them all along the edge of the paper plate to make the lion's mane. Cut pieces of plastic straws, snip off and flatten one end and stick them to form the lion's whiskers. Glue on a pompom for the nose and draw the mouth with a crayon. Our easy paper plate Lion is now ready. Draw the elephant's ears along the edges of the paper plate and cut out to reveal a circular face flanked by flappy ears. Colour in with a grey crayon. Stick on a pair of googly eyes and draw a red mouth. Now use a piece of grey felt and roll it into a tube-like structure. Glue the edges together. Now stick this felt tube on the paper plate to make the elephant's trunk. Paste a couple of small white pompoms on either side for the tusks. Our super easy paper plate Elephant is done. 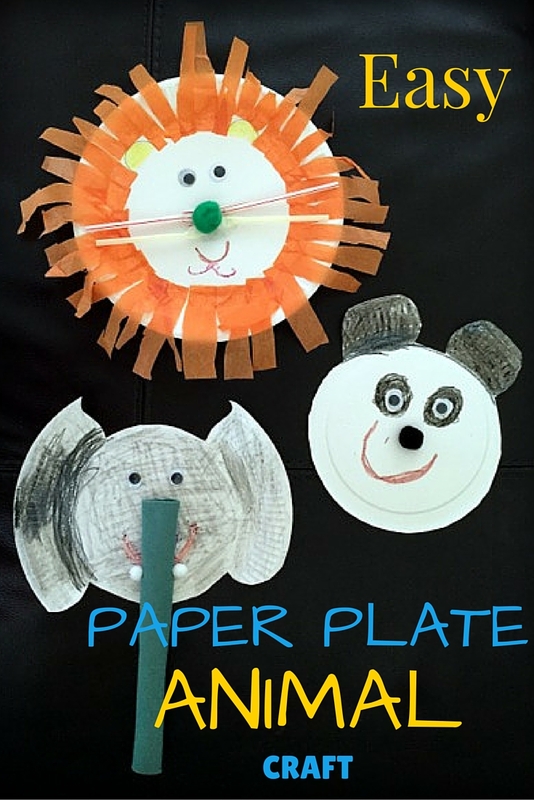 So what do you make of these cute and easy paper plate animals? Which is your favourite? Will you be making them? These are so cute I can't wait to make something like this when my son is a little older. I love doing crafts with my little one so getting ideas like this to try are always great. It's a very cute and easy idea to do. Great post!